Written by Sarasota Sun Devils on November 15, 2018 . Posted in Blog, Cheerleading. Some cheerleading teams are competitive, competing against other teams of the same level. A child can learn a lot through a competitive environment. Learning healthy competition, positive sportsmanship, and how to perform under pressure are lifelong lessons that children can apply to a variety of situations in their future. Cheerleading teaches communication. Whether your child is the captain of their team or a new member, they can learn about how to interact with others to work towards a common goal. Communication is an important skill to have, no matter how old you are or what your profession is. At a young age, children can learn how to communicate by participating in cheerleading. Cheerleading teaches a sense of responsibility to individuals. It is important for cheerleaders to practice, show up to team events on time, and stay diligent when it comes to their responsibilities as a team member. This same sense of responsibility can lead to success in other areas of life. If you have a child who is interested in participating in cheerleading, what are you waiting for? Sign your child up for cheerleading with the Sarasota Sun Devils! Cheerleading teaches teamwork, sportsmanship, responsibility, and communication, as well as athleticism and physical fitness. 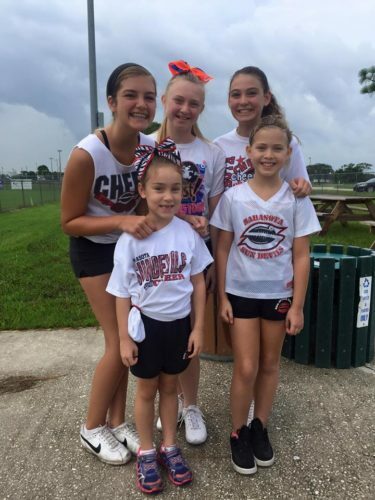 Our cheerleading team at the Sarasota Sun Devils is competitive, positive, and committed to providing an educational experience to children. For more information about our cheerleading program, visit our website. You can also register your child for our team through our website today!